Greater rheas (Rhea americana), Das Emas National Park, Brasil. I am a zoologist living in Japan. I mostly study animal behavior, but also conservation, biogeography and ecology (more about my research). I've written a few popular books about nature and travel; take a look. My hobbies include travel, nature photography, and searching for particularly rare and little-known animals (more). 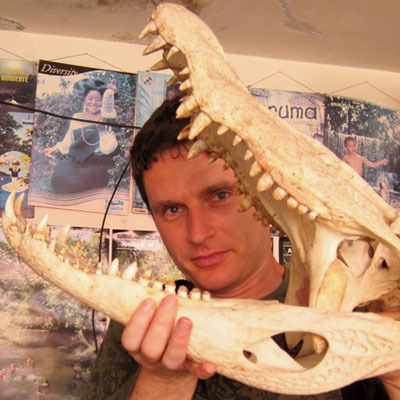 Me with a skull of a black caiman (Melanosuchus niger), Coca, Ecuador.